August 21, 2017 ~ Alexandria D.
Struggling to write three hundred words a day? What about five hundred words? A thousand? At first, I thought I couldn’t write more than eight hundred words a day until I read 5,000 Words Per Hour. Chris Fox made the impossible possible! Fox provides many awesome writing tips advising readers to write every day and forget about editing until a draft is absolutely finished. Sounds like common sense, right? If you haven’t been writing often, what you don’t know will surprise you! First of all, write as soon as you wake up. List writing as one of your top morning priorities. That way, you’ll have your writing session for the day completed before you do anything else. If you must wake up for school or work, wake up an hour or two earlier than you’re used to. It’ll be crazy difficult at first, but better once you keep up with the habit. Writing every day can strengthen your writing muscles. You don’t have to sit on your desk and write for eight hours straight. What matters the most is consistency. Writing daily at the minimum of thirty minutes is good enough. You can always expand your time limits whenever it gets too easy. You can switch around the times to your desire. It’s better to be writing something in a quick ten minutes than nothing at all. I have an awful editing habit. Whenever I write down a sentence or two, I tend to read it over and change it if necessary. Next thing I know my scheduled writing session is over and I barely wrote more than a paragraph. Have you down this before? Fox recommends writing until you’re absolutely done with your work. If you’re planning to write a short story for example, keep writing until you’ve reached the finish line! The story will be terrible, but it’ll be a finished terrible story. You’ll be able to see what you need to edit in a greater scale. I’ve tried this tip with a TV pilot that has been lingering in my mind for a while. There were moments I had to force myself to the next page whenever I was tempted to change a character’s dialogue or fix a lousy scene description. I reminded myself how great it will feel to finally finish that pilot. After all, there’s no greater feeling than accomplishing something you’ve been putting off. Fox refers small writing time blocks as “micro-sprints”. They can be five, ten, up to twenty-five minutes. Some people use their cooking timer for their sprints (aka the Pomodoro Technique). Make sure you record your sessions after you’ve completed your daily sprints. Reviewing your progress will keep you on track on what you need to improve and new challenges needed to be made. Next, Fox recommends recording words written per day, but I prefer pages. I like to start my writing first on paper. I used to write five to six pages of written content. Now, my average page count is ten, about a thousand words on the computer. As a matter of fact, there are studies reported writing is more effective on paper compared to typing. Writing by hand can increase brain development and elevate efficient writing. What kind of writer doesn’t want that? Are you an active storyteller? Pay extra attention to this tip! Fox creates his stories by outlining each one with a story timeline. A story timeline consists of three significant scenes: the inciting incident, the first doorway, and the second doorway. The inciting incident changes the main protagonist’s everyday life, the first doorway leads the protagonist to an unfamiliar world, and the second doorway leads to the final confrontation with the antagonist. Inciting Incident: Gandalf the Grey gives Frodo the One Ring. First Doorway: Frodo leaves the Shire with Sam, Merry, and Pippin. Second Doorway: The Fellowship of the Ring battle the Uruk-Hai at Amon Hen. Every story has this noticeable three-arc timeline. It’ll be helpful for you to plan timelines for your own story developments. You must commit to writing at all times if you plan to be a full-time writer. You’ll be better the more you work on it. Fox has an inspiring attitude towards his craft. He admits to writing every day including the holidays because loves he so much. It’s a fun way to make a living! Writing full-time means repeatedly creating, editing, and publishing your work. Plus, generating new ideas all the time. On top of that, sacrifice is required. You may have to cut off your Netflix marathons and weekend outings with your buds. The short-term pleasures will never compare to the long-term ones. Long-term commitment and discipline offers long-term rewards. Lastly, creating and focusing on long-term goals will kickstart your writing motivation. Do your writing goals include selling Kindle books on Amazon or creating an insanely popular blog filled with insightful content? Imprint these goals in your brain and take action now! 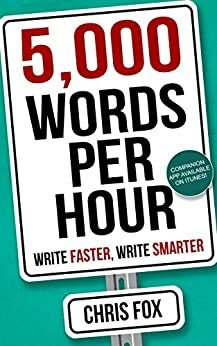 Overall, 5,000 Words Per Hour is a convenient book for writers in urgent need to increase their writing productivity. It’s a valuable tool for online content writers too. However, my only complaint is the book was too short. The book was so intriguing, I bummed out when I finished the last page. I’m sure Fox’s point was to get his readers writing as soon as possible after finishing his book. Fox’s writing methods were truly helpful. They have helped me become a more productive writer. Read this book and you’ll become one too! Comment below if you’ve read this book or have any writing book recommendations!